A quarter of people interviewed in the eastern Democratic Republic of the Congo last year during the ongoing Ebola outbreak believed the deadly virus wasn't real, according to a new study. A survey was conducted last September, one month after the country declared its 10th outbreak of the Ebola virus disease. Researchers interviewed 961 adults in the cities of Beni and Butembo in the North Kivu province, which is at the epicenter of the active outbreak. More than 25 percent of respondents said they believed rumors Ebola doesn't exist. Additionally, some 33 percent said they believed the outbreak was fabricated by authorities for financial gains, while 36 percent said they believed it was fabricated to destabilize the region. Nearly a fifth believed all three statements, according to the study published Wednesday in The Lancet Infectious Diseases journal. "Medical responses alone are not enough to stop the spread of Ebola," Dr. Patrick Vinck of Harvard University, who led the research, said in a statement Thursday. The ever-growing Ebola outbreak is one of the worst in recorded history, second only to the the 2014-2016 plague in multiple West African nations that infected 28,652 people and killed 11,325, according to data from the U.S. Centers for Disease Control and Prevention. A total of 1,044 people have reported symptoms of hemorrhagic fever in the Democratic Republic of the Congo's northeastern provinces of North Kivu and Ituri since Aug. 1, according to Thursday night's bulletin from the country's health ministry. Among those cases, 978 have tested positive for Ebola, which causes an often-fatal type of hemorrhagic fever. 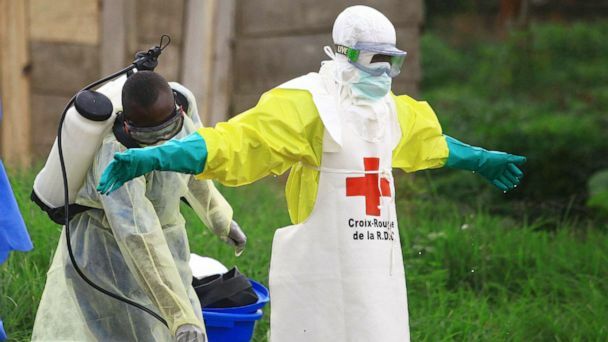 There have been 652 deaths so far, including 586 people who died from confirmed cases of Ebola, per the bulletin, and the other deaths are from probable cases. More than 40 percent of new cases since the start of the year are of people who died in the community rather than in a treatment center, according to Medecins Sans Frontieres (Doctors Without Borders), which recently suspended its activities in the hotspots of Butembo and Katwa after its facilities were torched. The local communities affected in the current outbreak have never before seen Ebola. It's also the first Ebola outbreak ever to occur in an active war zone, where violent conflict over the past two decades has killed and displaced thousands of people. The two cities where the survey was conducted are densely-populated urban areas along the country's border with Uganda that have been subject to a spate of sporadic attacks by armed groups, which are operating near the mineral-rich, volatile borderlands. Health workers and Ebola treatment centers have been targeted in the attacks. Moreover, the outbreak came amid heightening tensions over an upcoming election to replace the country's leader of 18 years. Tensions peaked in late December when the Congolese government postponed voting in certain Ebola-hit communities. According to the study, less than 32 percent of respondents said they thought local authorities could be trusted to represent their interest, though everyone felt local authorities were more trustworthy than those at the city, provincial and national levels. Health workers were deemed more trustworthy than authorities, though the study's authors note they did not distinguish between government, private and humanitarian health providers. "Ebola responders are often from outside local communities, so building trust via local leaders and service providers should be a cornerstone of efforts to engage with people to control outbreaks," Vinck said in the statement. "This is particularly important in conflict zones where information about outbreaks can become politicized." Low institutional trust and belief in misinformation regarding Ebola were linked to a decreased likelihood of adopting behavior to prevent the virus from spreading, per the report, including seeking formal health care and agreeing to the Ebola vaccine. Confidence in vaccination in general was actually high, with most respondents saying they believe vaccines work and are safe. But fewer said they believed Ebola vaccines work, are safe or are even needed to avoid contracting the virus, according to the study, which was funded by the Harvard Humanitarian Initiative Innovation Fund. "As the outbreak was announced, it was met with skepticism and mistrust," Vinck told ABC News via email Friday. "Early on, rumors about the reality of the epidemic and/or its use for political gains in a context of upcoming presidential elections seriously hindered the response. What our study shows is that the mistrust and misinformation that circulated directly affected people's behavior and decisions to seek care, adopt protective behaviors or accept vaccine." The study's authors note limitations to the research, such as the fact that the survey was done in urban settings and their findings might not reflect other affected areas, particularly rural. The World Health Organization, the global health arm of the United Nations, said in a statement Thursday it has teams on the ground engaging with the local communities, yielding "some success in many areas." This past week, nine community committees were established in the outbreak zone to enhance direct dialogue with health care workers and encourage community members to partake in the decision-making process of the response. Special dialogues are being held in communities where incidents of locals showing reluctance or resistance to the response have been frequent. An anthropologist first meets with the community to ascertain their concerns, then arranges for communal meetings where these concerns can be discussed among various parties, including local youth leaders, women's associations, traditional practitioners and health care providers. But the World Health Organization said that "finding a balance between providing adequate operational protection to community members at risk of Ebola and healthcare workers while simultaneously winning the trust of communities remains an iterative learning process." Although the findings of the recent study may not be entirely new to those involved in the Ebola response, they serve as "a call for action to invest in trust-building activities and research," Vinck told ABC News..
"There has been major investment and progress in the medical response," he added, "but our understanding of how individuals and communities react and behave during outbreaks remains limited and there are few insight into what approaches may actually work to build trust."